This year, at the fair of innovative financial technology, Finovate, in London, for the first time, performed the team from NF Innova software company, specialised in the omni-channel customer interactive solutions. Finovate is the most prestigious global banking conference featuring the innovations in the field of financial services. Finovate conferences consistently attract large, high-impact audiences of senior financial and banking executives, venture capitalists, press, industry analysts, bloggers, regulators, and entrepreneurs. NF Innova made a presentation of Personal Experience Module, designed in accordance with their main motto that the customer is always in focus. 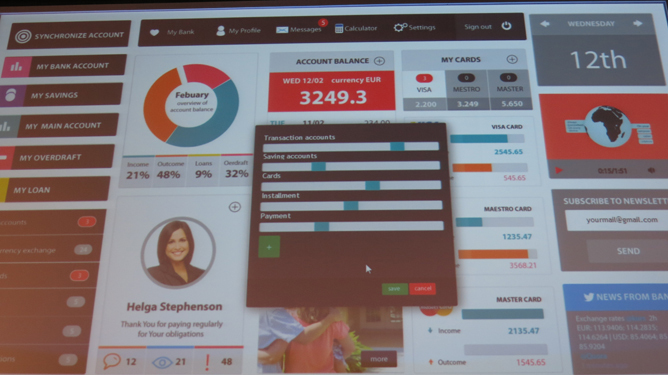 “Personal Experience Module, a part of iBanking product suite, enables banks to offer their customers a truly unique and tailored user experience. Namely, instead of static, CRM-based rules used for segmentation, this module provides for the adaptive behavior of the entire system, tailoring the user interface for each individual client, without the administration by the bank’s staff. Performance of NF Innova team has sparked a lot of interest and Personal Experience Module could, in the near future, to become a standard module within the electronic payment systems.